We are releasing a revised version of Volume 13, Issue 4 of the Review of Disability Studies. Most particularly, we regret that we made some editorial errors related to preferred pronouns, in the article “What is a Service Animal? A Careful Rethinking” by Margaret Price, by inadvertently overlooking automatic changes made by spellcheck. Providing fresh perspectives and time-relevant articles, RDS Journal's first issue of 2018 covers: school violence & mental health, reviews of To Siri with Love and Diffability Hollywood, upcoming disability studies courses, and just in time for #DDawareness18, articles on autism, FASD, and intellectual and developmental disabilities. The Review of Disability Studies: An International Journal is issuing a Call for Papers for a special forum on the subject of shame and disability, broadly conceived. It is hoped that through critical discourse addressing the historical and current contexts, contributing factors, effects, and responses to shame, greater understanding of this phenomena will diminish discrimination and violence. Full papers should be submitted directly to RDS online at http://bit.ly/RDS_AuthorGuidelines no later than June 1, 2018. Please submit to the category “Forum - Disability and Shame”. For questions about the content of the Forum, please contact the guest editors John Jones, jjones@truman.edu, Dana Lee Baker, bakerdl@wsu.edu, or Stephanie Patterson, stephanie.patterson@stonybrook.edu. Submissions to this special issue will undergo a process of peer-review. Authors will be notified of whether their papers will be invited for consideration in the forum by August 1, 2018. Prospective authors are encouraged to consult the RDS website at www.rdsjournal.org for more information about the journal and its formatting guidelines. Authors are encouraged to review previous issues of RDS in preparing their paper. Please note that initial acceptance of an article does not guarantee publication in RDS. 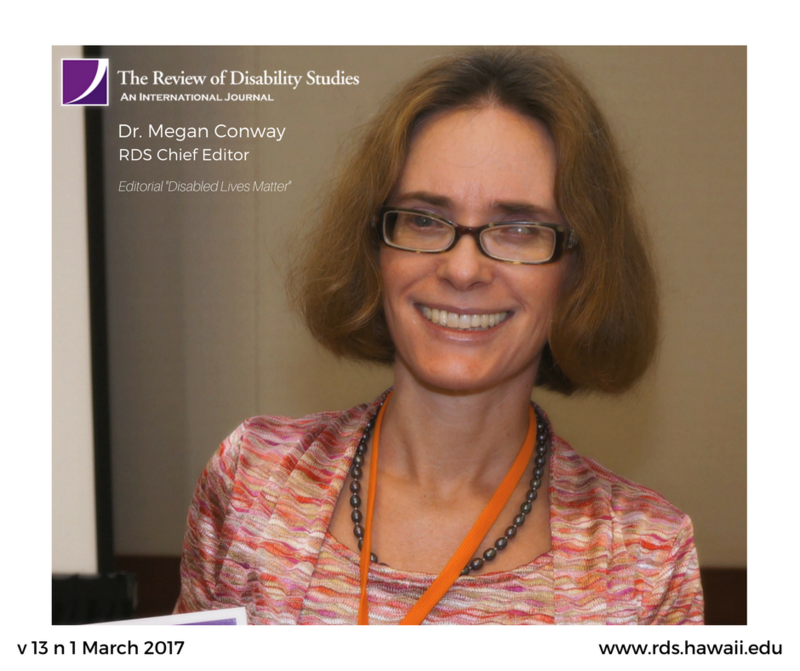 RDS is a peer-reviewed, multidisciplinary, international journal published by the Center on Disability Studies at the University of Hawai‘i at Manoa. The journal contains research articles, essays, creative works and multimedia relating to the culture of disability and people with disabilities. Registration Now Open for Spring Disability Studies Courses Through the UH Outreach College! For questions about course content, please contact the instructors directly (contact information below). From Canada to India, Guatemala to Germany, this special issue includes a research forum on Cripping Care: Care Pedagogies and Practices,” as well as multimedia, creative works, and a selection of the latest in disability studies’ dissertations & abstracts. The Review of Disability Studies: An International Journal(RDS) seeks proposals for a special forum on Dismantling Ableism: The Moral Imperative for Leaders. We are currently soliciting papers of up to 40000 words in length, including references and tables. The deadline for submission of papers is October 1, 2017. Papers should be submitted as a new submission at rdsjournal.org. The latest issue of the Review of Disability Studies is out! Dive into this issues' topics ranging for Disability Studies in Physical Recreation, Social Participation of Children, Immigrants in Australia, Anxiety as a Tool for Critical Disability Studies, Film Genre and Mental Illness and much more. Registration Now Open for Summer Disability Studies Courses Through the UH Outreach College! The latest issue of the Review of Disability Studies is out! Dive into this issues' advancement of ideas from authors representing Australia, Canada, Czech Republic, Hawaii, India, Norway, Sweden, and the United States. Disability Studies cultivates a critical narrative consciousness to unlock understandings of disability in the context of multiple disciplines, experiences, and perspectives. This topic area will explore and investigate ideas of cultural identity, social conditions, and social justice, including historical, socio-cultural, political, and economic perspectives about impairment; politics and legislation; diversity; and education. The latest issue of RDS is out! 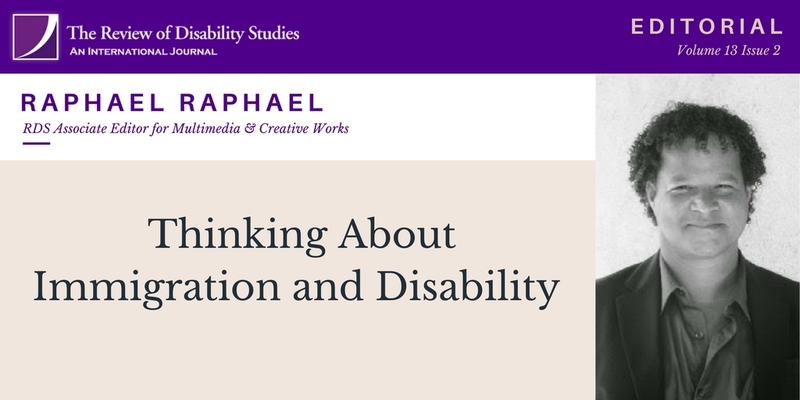 You won't want to miss this issue featuring an international tapestry of disability studies focused research, creative works, best practices, film review and much more. 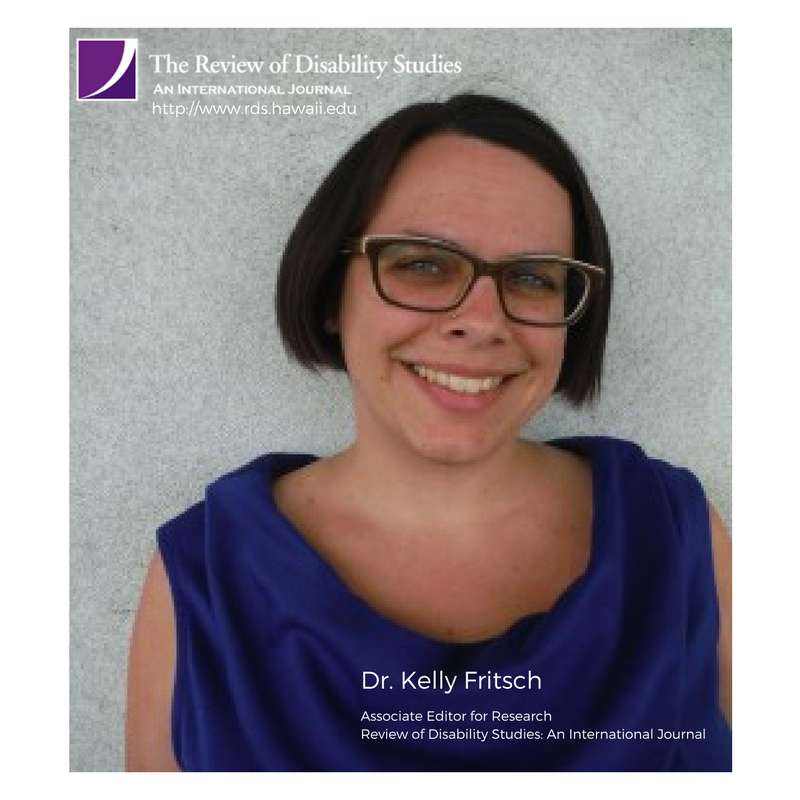 Check out our featured editorial Cripping Concepts: Accessibility by Dr. Kelly Fritsch, RDS Associate Editor for Research. The University of Hawaii at Manoa offers the Interdisciplinary Certificate in Disability and Diversity Studies, a 15 credit graduate level (master’s, doctoral, and post-doctoral) program sponsored by the Center on Disability Studies (CDS) in the College of Education. CDS also offers both graduate and undergraduate level Disability Studies Courses that can be taken as electives. Population aging is taking place in nearly all countries across the globe. Within current research and policy, the relationship between disability and aging is often oversimplified and underdeveloped. Disability is assumed to be a product of unsuccessful aging, and aging as an obstacle to living well with a disability. This special issue of The Review of Disability Studies: An International Journal (RDS) features eight original articles that analyze how disability and aging appear within research and policy in Canada, the United States, Australia and Switzerland. The articles in this international collection use interdisciplinary perspectives to explore the relationship between disability and aging in its complexity. They expose and challenge age and disability related myths and misconceptions and reconsider why global population matters. The Review of Disability Studies: An International Journal invites scholarly, multimedia and artistic explorations of care as a critical pedagogical terrain for the 2017 Special Forum, Cripping Care: Care Pedagogies and Practices. The newest issue of RDS is out!! You won't want to miss this very special edition featuring a forum from the 2015 Pacific Rim International Conference on Disability and Diversity - Volume 11, Issue 4, online now! Become a subscriber today! The Fall semester is well under way and our International journal is receiving submissions from all over the world! The newest issue of the Review of Disability Studies (RDS), Volume 11, Issue 3 has something for everyone. Despite the passing of the Individuals with Disabilities Education Act (IDEA) in 1975 granting children with disabilities in the US access to education and integration in schools, many classrooms remain segregated today. Priya Lalvani from Montclair State University shares her research on this issue in the manuscript entitled: "Rethinking Disability and Inclusive Education: A Teacher Study Group." Exploring institutionalized ableism and the role of educators in the systematic segregation of students with disabilities in schools has important implications for inclusive education in democratic societies. The tourism industry in Zimbabwe is booming. Despite the fact that tourism is a social right for all, and people with disabilities represent a substantial market for tourism, little has been done to ensure access to tourism facilities for those with disabilities. Oliver Chikuta draws attention to this topic and makes recommendations in his research article "Is There Room in the Inn? Towards Incorporating People with Disability in Tourism Planning." The internationally acclaimed artist Lee Mingwei gave the "gift of song" to Maria Timberlake, our Associate Editor for Creative Works. In Maria's article she shares how she felt receiving such a gift, and her experience later as artist for a day in Mingwei's Living Room exhibit at the Isabella Stewart Gardner Museum. Maria draws implications from Mingwei's art to her studies on inclusive education and his emphasis on human connection, paying sincere attention to others, and dissolving barriers. She describes her experiences and insights in her piece entitled, "Inclusion and the Gifts of Art." Remember, to view the current issue and any content from the past year, you must be a subscriber! So, what are you waiting for? It's a great time to give yourself the gift of knowledge with a subscription to the Review of Disability Studies!! Register and Subscribe today. We are always looking for submissions, so spread the word! We are anxious to receive your research articles but would also love to get your creative submissions- poetry, essays, short stories, art work, photography, anything in the area of disability studies that you want to share with an international audience. Send your work today! For more info, check out our website. Wishing you a productive Fall. Until next time, mahalo nui loa!! We are pleased to announce the release of an exciting Call for Papers for a special forum on Disability and Aging for the Review of Disability Studies: An International Journal.